The Gowanus Canal is long overdue for a makeover. The first week of October, preliminary dredging began on a large-scale environmental renewal of the site, which will cost around $500 million in total. Since early 2010, the body of water has been a federally-designated Superfund site, meaning it has been identified a significant hazard to people, animals, plants, and everything alive – in short, an environmental and public health disaster just a rainy day away from cross-contamination. This will be the first time the city has ever endeavored to clean the canal since its channelization in the mid-1800’s (though humans have technically cohabited with the canal since it was a creek in the early 17th century). The surrounding neighborhood has been experiencing paradigm shifts of its own. Residential development has been far from deterred by the site’s chemical underpinnings. The neighborhood’s first luxury high-rise opened in the summer of 2016 at 365 Bond Street. 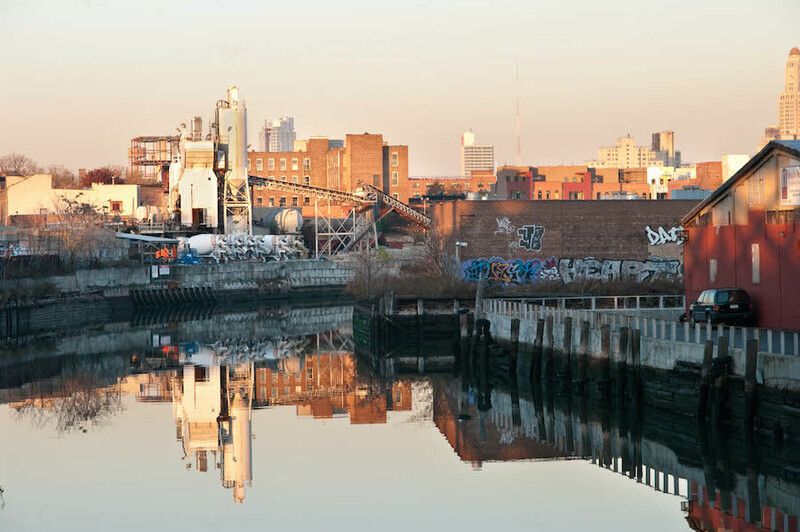 Shortly after, the Department of City Planning initiated Plan Gowanus, a direct community engagement platform to look at rezoning the neighborhood in light of increased interest in waterfront development. The city expects this engagement process to continue for at least another two years. How and whether Gowanus’ rezoning will align with the cleanup process is not entirely clear yet. According to the EPA’s progress page for the Gowanus Canal, the site has not even received a preliminary assessment or site investigation, despite the fact that dredging has begun. A developer at Property Markets Portfolio (an owner of many waterfront properties along the canal) estimates that the process will wrap up in roughly five years. What remains to be seen is whether more attention will be paid to the health risks involved in developing a Superfund site at the canal’s scale. At present, 26 million gallons of raw sewage flood into the canal per year, which the advent of new underground sewage tanks is expected to reduce to 11 million gallons per year. Flooding is still a common occurrence for nearby residents–in fact, there are a series of informal underground waterways winding through the basements of locals, spreading out as far as Prospect Park. 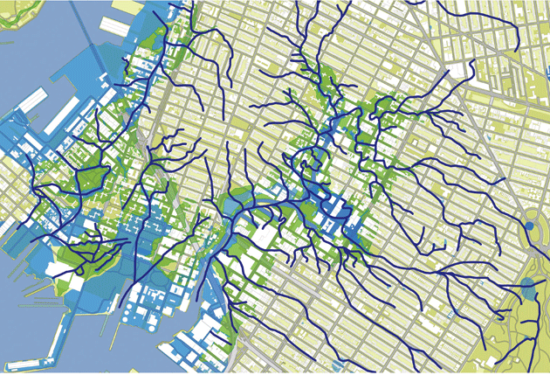 Eymund Diegel, an urban planner fascinated with the history of the canal, mapped them out in a recent New Yorker piece. Landscape architects have imagined the remediation of the canal from slightly more utopian angles, from DLANDstudio’s Gowanus Canal Sponge Park, a more traditional waterfront park that would simultaneously help clean the canal, to SCAPE’s Gowanus Lowlands, an adaptive design allowing direct interaction with the waterfront.